The cold sea breeze nipping at your fingers. The wooden groans of the deck and the sound of overlapping sea waves. An eerie atmosphere that forebodes carnage. Welcome aboard the Obra Dinn, a ship lost at sea for years and suddenly found on England docks, empty. Whether you fulfil the promise of deducing the fate of all 60 passengers rests on your shoulders as the hired insurance investigator. 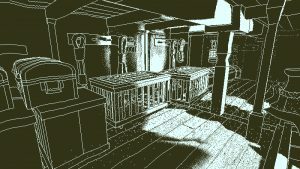 Return of the Obra Dinn is a first-person adventure game made by Lucas Pope, the creator of the indie “pearl” Papers, Please. Only recently coming out of a years-long demo-only hiatus, his newest mystery game not only filled my expectations, but it also exceeded them. Let’s talk about Return of the Obra Dinn. At its grainy, black and white core, this is a detective game. Be ready to bring out your pens and notebooks as you’ll find your attention caught by the details and the facts tangled inside this ship. It is the only place you’ll play in as the character. You have one thing that’s going to help you in the investigation about the past: a memento more in the form of a compass. The game mechanic here is that you’ll use this gadget when viewing the remains of the shipmates. Effectively travelling to past scenes that reveal snippets of conversations. It’s how you will navigate through the past and see snapshots of the person’s demise. Through those small journeys back you will guess how it happened. Also as these memories have a limited time to be viewed, you can go around the ship. You may even be rewarded with extra insight. Thankfully, the game is lenient enough to allow you that after you guess three people’s identities according to the list, it will inform you whether you’re wrong or right. It depends on how long you want this game to be, as it requires your focus. Personally, I had to take a few days off from playing just so I can get a different perspective on the moment I got stuck in. As I mentioned before, you only get a compass and a trusty book, almost empty at the start of the game and by the end of it, all the 100 pages should be filled. You only interact with the environment when you open doors. The scenery changes when you use the compass on corpses, skulls, ragged clothes, and much more. Some doors open after you unlock a memory. At the start, the ship may be seemingly small. But the game makes sure to build it up with each person identified in your journal. In the end, it seems like Lucas Pope has fleshed out an entire nautical world, meticulous bit by bit. 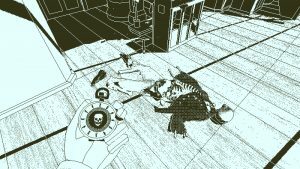 Currently, Return of the Obra Dinn is on Steam, Humble and GOG. You can follow Lucas Pope’s twitter for recent updates and added info on the game itself. Praised be the Obra Dinn. For more indie games, subscribe to the Indie Pearls weekly newsletter or follow us on Facebook or Twitter!